That line made famous by Cuba Gooding Jr. in the movie “Jerry Maguire” exemplifies the greed of sports management. Eugene Lee, professional sports agent, is seeking to go beyond this. As the NFL Draft takes place on April 20, Lee will be tending to the needs of his players, as they hope to realize their dreams of finally making it to the National Football League. Lee, a 40-year-old Korean American born and raised in Canton, Ohio and currently living in New York City, almost missed his chance to become an agent. Lee’s career representing football players could have started on the basketball court. As a law student at Notre Dame, he became friends with several football players while playing pickup basketball games. They asked Lee if he could help represent them as a player agent, but despite the opportunity, he had already committed to a law firm in New York. “I gained great experience with corporate clients and I started to realize that I was getting a great skill set,” Lee said of his time working in corporate law. Yet, the opportunity to help college players make it in the NFL became an undying passion. He decided to take on the additional duties of being an agent. Not only did he have his responsibilities as an attorney, Lee became an NFL certified agent and worked on the side representing Notre Dame football players. Eventually, Lee decided to leave the steady income of a big law firm for the uncertainty of the sports agent business. He was 29 at the time. Though the transition from high-paid lawyer to newfound sports agent was dangerous, Lee relished it. Lee founded his own sports agency, ETL Associates, in 2003. The sports agent business is an ultra-competitive arena that has been known to include unsavory individuals, illegal payments, and backstabbing. Despite the perils of the industry, Lee is upbeat and positive. He has unwavering goals for his company and the clients he represents. ETL Associates has a modest staff of six, but its reach is nationwide, with locations in Houston, Los Angeles, and a home base in New York. As an agent, Lee does the full gamut of duties for his clients, including contract negotiation, procuring endorsement deals, working on personal branding, social media strategy, and post-career counseling. Lee landed a big opportunity when he was picked to star in an ESPN documentary on sports agents. 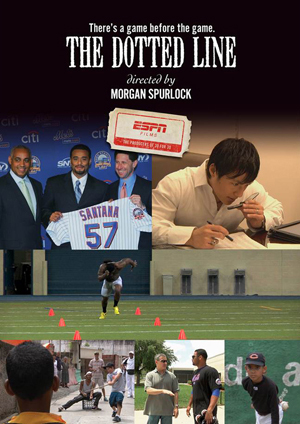 “The Dotted Line,” directed by Morgan Spurlock (maker of the acclaimed documentary “Super Size Me”) explored the sports agent business. Lee said that he received a phone message out of the blue from one of the documentary’s producers, Matthew Galkin. After speaking with Galkin, Lee agreed to let cameras follow him around while doing his job. The documentary shoot started in January 2011 and followed Lee up until the NFL Draft in April, showing Lee and his team travel to pitch clients for representation and attend workouts and the NFL Combine — where prospective college players are tested by NFL scouts prior to the draft. When searching for clients, Lee looks for character, in addition to a player’s ability to play. “We want to make sure that we represent men of character to ensure it’s a right fit for the agency,” he said. “You’re selling yourself out,” Lee continued, referencing people who compromise business values for the opportunity of making a profit. He said that seeking out players with character is also an efficient use of time, as he doesn’t have to worry about issues with players off the field. There have been times when he has declined to represent players after learning more about their character. When targeting players to recruit for representation, Lee looks for common ground. “You look for a nexus: teammates of clients, a common connection, alma mater, geographic connection, and we dig a little deeper,” he said. Lee enjoys the competitiveness of the sports agent business. Signing a player for representation is an investment. Lee spends $10,000 to $20,000 per client to prepare them for the NFL Draft, without knowing if a team will pick them. During the documentary filming, one of his clients fired his agency after being picked in the NFL Draft.